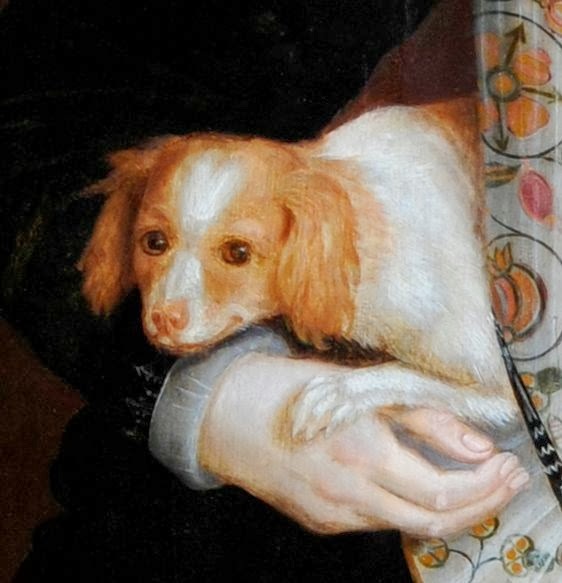 Anne Boleyn loved dogs. She doted on Purkoy, the little lapdog given her by Sir Francis Bryan, who had received it from Honour, Lady Lisle. When he brought him to court, the Queen fell in love with him straight away. Anne called the lapdog Purkoy, the old French phonetic spelling for ‘pourquoi’, which means ‘why?’. Could it be that the little dog had an inquisitive and curious nature? If so, Anne Boleyn must have found it very amusing. As a royal pet, Purkoy was taken well care of. He would eat bread (the Tudors thought that kept dogs gentle) and bathe daily. Then, he would be perfumed too. Sadly, this pampered existence didn’t last long. A few months later, in December 1534, Purkoy died in an accident. He “had fallen from a window”. No one, knowing how much the Queen loved Purkoy had the heart to tell her. The King had to break the news to her. She was inconsolable.